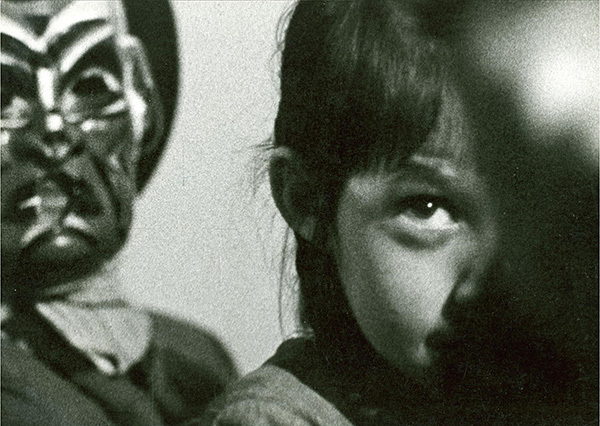 Image from the film Pour la suite du monde courtesy of the NFB/ONF. Used with permission. Pierre Perrault was one of the most important filmmakers in Canada although largely unknown outside of Québec. He is credited with developing a unique “cinema of speech” that spoke directly about Québec, its land and its people. 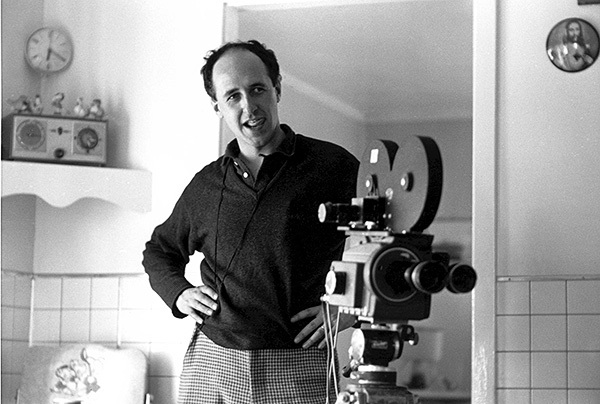 His work has had an enormous influence on a generation of younger filmmakers. Perrault studied law and went to spend two years as a lawyer before moving to radio as an announcer. He was also a poet and dramatist. (October 20, 2017 – Toronto, ON) The 23-sq. kilometre island of Île-aux-Coudres is located where the St. Lawrence River opens into the Gulf of St. Lawrence, two kilometres from the North Shore. The famous French trader and explorer Jacques Cartier gave it its name in 1535, after finding numerous hazel trees on the island devoid of habitation. (Coudriers is the archaic French word for Hazel tree.) Cartier was the first European to enter the St. Lawrence estuary, and the first Catholic mass celebrated in Canada took place on the island. The Séminaire de Québec was given ownership in 1687, and it received its first settlers in 1728. In 1759 the English arrived, and the island’s strategic location provided moorage for General Wolfe’s flotilla before attacking Québec City. 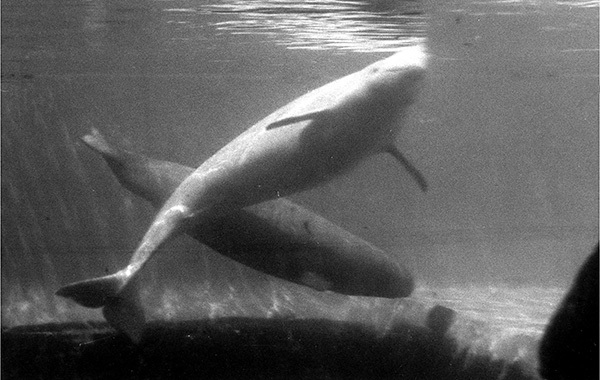 Beginning some time in the 18th century, white porpoise fishing – the name given to the Beluga whale by the islanders – began. The method consisted of thousands of poles arranged in the shape of a ‘B’ in the shallow waters that surrounded the island (pictured above), with an opening in the centre. Belugas entered the trap at high tide and remained captive at low tide. The white porpoise fishery ended in 1924. Free ferry service to the island from Saint-Joseph-de-la-Rive on the North Shore began in 1930, and today Île-aux-Coudres is a popular tourist destination for cyclists and kite surfers, who flock to the shallow, rough waters of the St. Lawrence. Traditionally, Québec artists have seen the vastness of the North Shore, the coldness of the Canadian winter and centrality of the St. Lawrence River as the signposts of their civilization, as the formative symbols of their imagination. From the folkloric songs of Gilles Vigneault through the novels of Anne Hébert to the films of filmmakers diverse such as Gilles Groulx, Gilles Carle, Jean-Pierre Lefebvre and Pierre Perrault, this symbology can be found. It’s the landscape of the mind found in much of Québec art throughout the years, in many different mediums. Discouraged by law after two years of practice, Perrault began writing poetry and working in radio. Renouncing the codes of legal language, he began to concern himself with the creative use of speech. 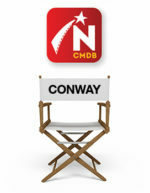 In 1956 he produced a series of radio documentaries on life in Québec for Radio-Canada entitled Au pays de Neufve-France, after which he worked with director/producer René Bonniere to prepare a comparable series of film documentaries for television. In the course of making the series, he became acquainted with the Tremblay family and other inhabitants of the farming, boat-building and shipping community of Île-aux-Coudres, about a two-hour drive from Québec City along the North Shore. Due to its 200 years of isolation from the mainland, the islanders spoke a distinctive form of archaic French. From this encounter with this community of 1,000-or-so souls, and from his realization that he needed visuals to capture the gestural aspects of speech, Perrault’s real work in film began. To raise the money, he had to have a project (i.e. 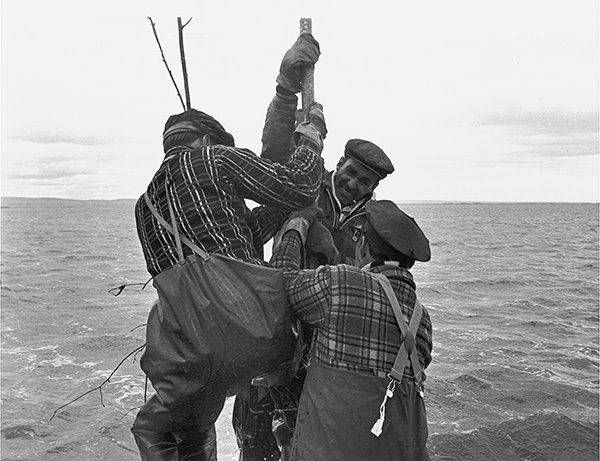 a hook), and the project with which he was successful in interesting both Radio-Canada and the National Film Board was a film on the islanders’ way of trapping the once-profitable Beluga whale. Perrault had to interest the islanders in reviving the tradition. This would be the pretext: while watching the islanders discuss the possibilities of reviving the hunt, and while observing them as they set about once again to construct their large traps to catch the Beluga, Perrault would able to make his film. It would be amiss not to the mention the odd charismatic charm of Alexis Tremblay and his huge family, which included his four-foot-tall wife, Marie, his 17 children, and 60-odd grandchildren. He could trace his family roots to the original settlers and was very proud of the island’s connection to Cartier. When Pour la suite du monde was first broadcast on Radio-Canada (to a record-breaking audience of five million), it had to use modern French subtitles and Alexis became an overnight sensation. He welcomed Perrault and the audience into his kitchen and his way of life with charm and unsuspecting warmth. His joviality and energy wooed an entire province. Here was an authentic, honest-to-goodness Québécois. Pour la suite du monde is a remarkable documentary with so many moments of loving celebration of the day-to-day details of these people’s lives. It’s not about capturing a whale (although they eventually do trap one). It’s an audio-visual recording of a particular style of living, of an animated way of gesturing and of a special kind of dialect – a unique form of speech. It has been written about extensively and is regarded as one of the greatest films ever made in Canada, winning Film of the Year at the Canadian Film Awards and many international and festival awards. The subsequent two films are less well known. In the second one, La Règne du jour, Alexis Tremblay, his wife Marie, their son Léopold and daughter-in-law Marie-Paule, travel to western France, the land of their ancestors and the root of their cultural values. In Paris, Marie goes to the hairdresser for the first time, they walk around the farm that belonged to the first Tremblays and Alexis is shown parish documents that record the marriage in 1623 of his ancestor, Pierre Tremblay. But the France of the 1960s is no longer the France of Jacques Cartier, no longer the France that Alexis so passionately believes in. In fact, with her laced bonnet and gentle wisdom of her weather-beaten face, Marie looks more ancient that anyone they encounter. She enjoys the trip, but for Alexis it’s a series of disappointments. Ironically, while the trip is a disappointment for Alexis, it’s an affirmation of the distinctive Québec culture, with its own language, customs and beliefs. If at the end of Le Regne du jour the personal faith of Alexis is shaken, the collective faith of the Québec nation is confirmed. It also marked a major development in Perrault’s use of direct cinema in that the central event – the trip to France – was entirely initiated by him, but the strength of the film comes from its remarkable editing of the Tremblay’s discussion of their travels and the actual visit itself. 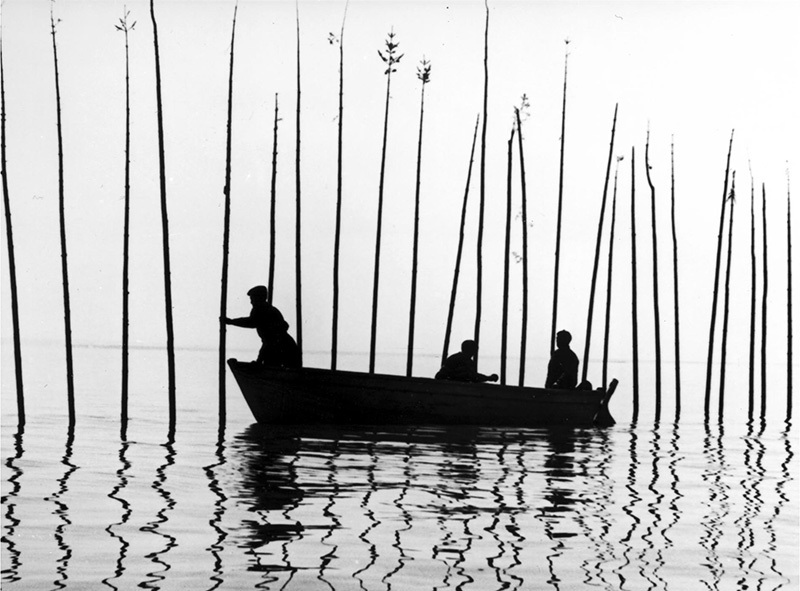 The third part, Les Voitures d’eau, in some ways is both a stylistic and thematic summation as well as a development of the earlier films. Perrault here retains the direct shooting style of the first film (and its emphasis on language) and extends the editing approach of the second to explore the economic and social realities of a people whose values put them outside the framework of capitalist production. The two-part narrative depicts the building of the last water schooner and the departure from the Île-aux-Coudres of the younger generation looking for work and the problems they encounter in the outside world. Collectively, all three films succeed in presenting us with an insight into what is unique about Québec culture, and raises doubts about the ability of this uniqueness to sustain itself into the future. Within the history of cinema, these three films represent a remarkable achievement. Within the history of documentary, they are without parallel. At no point is there any commentary. At no point is there a privileged voice to tell us what to think. They are all built up by a network of interweaving voices defining life values through the energy of their speech. The Île-aux-Coudres trilogy represents Perrault’s most distinguished contribution to the world of cinema, within which Pour la suite du monde is demonstrably his masterpiece. Northernstars.ca thanks the National Film Board for their assistance in making this article possible by providing images from Pour la suite du monde.